[AUG. 19, 2000] In the first decades of the 19th century, Europeans were intrigued with America—this peculiar new nation, this loose collection of states, this wedge of soil between the blue Atlantic and the great western wilderness, this polity of rabble, this kingless land of no particular religion, this robust, untethered marketplace. So, curious Europeans did what Europeans do best; they traveled to our shores, observed our odd ways, returned to their homelands and entertained their countrymen with their tales. In the 1830s, Alexis de Tocqueville spent months in America, traveling about, talking to the folks, taking notes and ultimately penning "Democracy in America." This French aristocrat’s findings inform our understanding of our own nation yet today. Especially he was impressed with our propensity for association. "Americans of all ages, all stations in life, and all types of disposition are forever forming associations. There are not only commercial and industrial associations in which all take part, but others of a thousand different types—religious, moral, serious, futile, very general and very limited, immensely large and very minute. . . . In every case, at the head of any new undertaking, where in France you would find the government or in England some territorial magnate, in the United States you are sure to find an association." Well, Alexis would love Logan County. If you think our homeland is made great by the bold initiatives of strong individuals, you may be only half right. True to the American way, we are also adept at finding common cause, pooling resources, engaging in joint ventures, acting on altruistic impulses. What Tocqueville found astonishing, we take for granted. I would begin a laundry list of local associations, but I fear I would neglect too many dozens of worthy groups that lie beyond my experience. But let me take a stab at a few categories of association to give a flavor of the wealth of social capital we have accumulated. First there are the churches—groups of people who voluntarily associate around a set of shared beliefs and values. In Logan County, there is virtually a church on every corner. Each church is itself a source of support and spiritual guidance to its members and a resource to the broader community. From Sunday worship service to Vacation Bible School to youth groups and couples clubs to food pantries and soup kitchens to weddings and funerals to basement chicken dinners, our churches are places of community. Service organizations—Rotary, Optimists, Kiwanis, Lions, JCs—and fraternal groups like the Elks and Eagles, Moose, Odd Fellow and Masons, with their various auxiliaries and offshoots, draw together people who enjoy one another’s company and choose to invest their personal wealth in projects that better the lives of many people beyond their memberships. If you don’t like them, don’t join them. Freedom to associate is the enlivening spark that invigorates collective effort. Want to join the Lincoln Area YMCA? Five bucks gets your entire family in the group for a year, and the reward is access to everything from child care to swim lessons to family picnics to soccer leagues. All this with an underlay of Christian values. What a deal! Like theater? Lincoln Community Theatre features your friends and neighbors in a summer fest of stage delights. Like music? There are bluegrass groups, a symphony orchestra, gospel choirs, and barbershoppers. Each is its own group, formed by free association of those who share a love. Deer hunters and archers have their groups. Ducks Unlimited celebrates waterfowl, not to be outdone by Pheasants Unlimited, Quail Unlimited, and whatever grouse enthusiasts call their organization. Boy Scouts, Girl Scouts, 4-H (I promised not to resort to a laundry list; I know I’m neglecting some very good groups) continue to form the character of generation after generation of youngsters. 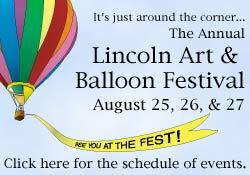 Main Street Lincoln fills our parks with music on summer evenings, and the Chamber of Commerce gives us bragging rights to tell our snooty aunt in New York that "hundreds, maybe even thousands of balloons ascend from our fairgrounds." Don’t forget the art fair. Labor unions are associations, and so are groups that assemble to promote the cure of disease and support the afflicted—cerebral palsy, diabetes, arthritis, muscular dystrophy. The business women have an association, and so do the university women. One association promotes breast feeding and another Tai Kwon Do. Every breed of every animal has an association devoted to it. History buffs gather to tell tales of the boy Lincoln. Genealogists unite to swap stories of their Logan County ancestors. Model airplane enthusiasts crank up their little machines and watch them buzz overhead. Lovers of real airplanes hang out at the airport museum—created by the good work of freely associating flyers. Salvation Army, Catholic Social Services, United Way—don’t get me started. There are too many to list here. Political groups? Did you see the Republicans and the Democrats at the county fair? The fair? That’s another fine organization. What about Railsplitters? Stop me before this article becomes a narrative form of the yellow pages. How do I get myself out of this mess? By including so many wonderful associations that fill life in Logan County with blessing after blessing, I only risk offending devotees of the groups I omit. So let me lay down a challenge to the good readers of LDN. E-mail us and tell us about your favorite Logan County associations—ones I have mentioned and ones I have neglected. Maybe your favorite is a formal organization with bylaws and officers and all the rest, or maybe it is just a loose-knit gaggle of good fellows. Tell about it. That is the only way I can avoid offending you. Just click this address and bail me out: ldn@lincolndailynews.com. Thanks.